While cleaning out their personal belongings from the club room, the members of the Light Music Club find an old guitar of Sawako’s – which turns out to be surprisingly valuable. The “Welcome! !” on the white board from the previous episode is still present, but with more doodles added. It is however wiped clean a few minutes into the episode. Mio quickly walking away after grabbing her “weird potato nosed head” from Ritsu is, unusually, animated “on ones”. First appearance of Ton-chan the turtle. Ritsu gets smacked on her forehead for being greedy, but doesn’t get hit over the top of her head. No bump. This episode is based on the fourth regular chapter from Volume 3. It’s a very faithful adaption, with the only major changes being the addition of the visit to the hardware store and the introduction of Ton-chan. A fine episode with a few decent laughs in it. The funniest parts, to me, are Ritsu trying to eat the receipt and the gang’s various reactions to suddenly getting their hands on a significant amount of money. Otherwise, the only thing that particularly stands out about this episode is the introduction of Ton-chan the turtle – the club’s “mascot” character from this point on, I suppose, and one that never existed in the manga. Great analysis! 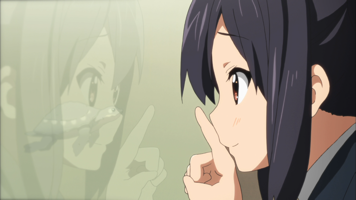 Keep it up because K-On! fans like myself love reading this stuff. Oh man, some of the OST track names are so cute, "patrol of stroll" just hearing the title makes me feel bubbly inside.